An introduction to matrix scanning, using the SparkFun 4x4 Button Pad. Learn how to connect that sweet transparent OLED. If you want to use a shield with your Mega, you will want to consider these key differences in communication. I would consider this an Uno with more memory and more pins. There are a few things you'll have to keep track of such as I2C and SPI busses on different pins and having more than one UART. They are both AVRs and so should be about 99% similar minus the things I mentioned. If you are looking for more advanced I'd take a look at the SamD boards which are ARM based and therefor the interworkings are much different. The Arduino IDE is pretty good at being able to translate code into various chips, so even on those boards things should be pretty straight forward. I'd say if you need more pins or more memory get the Mega, if you don't stick with the Uno. If you need something more advanced (more memory, more options, more configuration, faster speeds, built in USB, etc. ), or just want to learn more I'd get a SamD board. any idea when it will be back in stock? i placed an order yesterday for one. Im on pins and needles till they come in. Im so exciiiiiited! Just got mine in today. I know ESD is a myth :p , but wouldn't it be a good idea to package these guys in an anti-static bag? I've seen this comment for another Arduino product as well. I guess Arduino is to blame, not SFE. Yes, Arduino is sloppy is almost every aspect of their business. Nothing has helped. I have a simple program flashing an LED and writing to the Serial monitor. It works on an Uno but on the MEGA nothing is printed to the serial monitor. This is a huge pain for debugging! When are these going to be back!!!!!!!!!!!! This was my third Arduino board. After buying, I didnât need the MEGA at all, well for most of the basic stuff. Itâs 4x faster on uploads than the UNO. For me it is great. And it looks like I have more homework to do to get something big happen with the MEGA. Just to say that at first I thought that I paid more for something not very useful. Now it works in a project. Good catch! Getting that fixed now. Thanks for pointing it out. Hi i am working on an inverted pendulum problem in which i have to determine the orientatien of 3 segments. I was wondering if it is possible to read out the information of 3 itg3200 gyro with one of these arduino megas or will i need multiple.. Unfortunately not, or at least not via hardware. You can only have 2 gyros on a single I2C line, which this has only one of. However, you can bit bang an extra I2C line as long as you're not expecting blazing speeds; it will be a bit slower. Is there such thing as a ATmega2560 that is through hole instead of surface mount? A 100 pin DIL package would be about 13 cm(!) long, and due to its large pin count impossible to insert in a socket. Still want one? For the record: There are breakout boards just for the ATmega2560 (that includes decoupling caps, some even have a crystal nice and close to the chip) and generic breakout boards for matching chip packages that do break out to PTH headers. Though at that point, you probably might as well either design your own board or go for an Arduino(-like) that has the chip. Nope; the largest ATmega that has a through-hole version is the 1284 I believe. I have a vendor claiming that the Mega 2560 he shipped to us is a Rev3 although it is not indicated on the silkcreen. Simple question, are all R3's marked as R3 or not necessarily? Thanks. Thanks. That's what I thought. Visually the R3 changes are identical on this new board, as per your reference, with the exception of any markings that it is an R3. Believe it or not, this "minor" detail is holding up production. 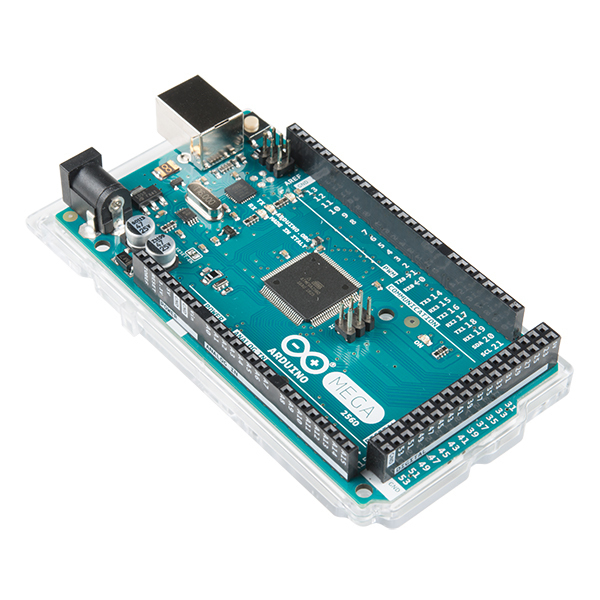 Is this an official mega from arduino? Wow, i have never had so many issues with an Arduino board as i have with this one. Uploading fails 99% of the time. 'avrdude: stk500v2_ReceiveMessage(): timeout'. Common problem if you google it. Have tried every suggestion out there. Next step is apparently to upload a new bootloader,. I am going to keep battling with it, but unless you really need the extra pins stick with a board that works, see if the extra pins on the Leonardo or Nano will get you going. This mega clearly has issues. I should add i can load the simplest of sketches onto it no problem. The one i am stuck with is only 18k though and it loads fine onto a Uno R3, i just need the extra pins and can't for the life of me get an 18k upload to complete on this Mega. I have tried every suggestion the interwebs has to offer. I am amazed that this thing has not been disontinued or replaced givem how many hits you find if you google 'Arduino Mega upload issues'. The Schematic Document above is not the R3. You can tell by the ATmega8U2 used instead of the ATmega16U2. Does anyone know the temperature range of this board? Can it be used outdoors in a Northeast winter? It will be kept dry in an enclosure, but it can't be kept warm. It will stay outdoors and there won't be any sudden temperature changes. Thanks. Since this has multiple serial ports is this the best way to support multiple RFID readers? Does this come with the download cable, or do I have to order that separately? you can get this cheaper on Mouser.com. Best place to go, 58 bucks for this, you get it on mouser for 30 bucks. I always notice everything is so much higher on sparkfun. The only thing I bought from here were some LED drivers I couldn't find in individual purchase. That is not really correct. The Mouser price is closer to $40 than it is to $30. AFAIK, Mouser does not do a lot of development, support, or tutorials for this - they are primarily targeting the professional/commercial market, while Sparkfun is primarily targeting the hobbyist market. If you want to bargain basement shop, why not go all out and order some crappy Chinese knock off that does nothing to support the community? But if you are a hobbyist I would suggest you support companies like Sparkfun, Adafruit, EMS, Jameco, etc.,. Some of us who are doing commercial things and making a lot of purchases from the commercial suppliers still buy some stuff from folks like Sparkfun - it is pretty handy to be able to prototype an idea using a BOB. Besides, I like the idea of supporting these businesses. Bottom line - if you want to have the goodies made available by a business catering to you, don't be such a bloody cheapskate, and don't abuse their open comment policies by undercutting them on their own site. Of course, if you are manufacturing a commercial product and buying chips in quantity, then price sensitivity is a different story. P.S. Sparkfun is actually a little cheaper than "The Lady" on this one. Very well said. There is more to consider here than saving a few bucks. The whole Arduino world is built on the idea of open source, supporting eachother, and loyalty. Sparkfun offers competitive prices and an amazing selection, plus amazing support. They will get my money because I want to support them and I want them to support me with great tutorials and product resources. Extremely narrow-minded view on life you must have. Everyone has a choice. But why would you not save $13 by getting the Mega from a cheaper source like Mouser and then be able to buy more goodies from SparkFun with the money saved? Just checked today and Mouser has the ARDUINO MEGA2560 REV 3 for $45.95. thanks for bringing this to our attention, prices have recently dropped from Arduino. Anyone else having problems with the Mega's serial communication? The basic examples such as Serial Event do not work at all. You shouldn't be having problems with the example code included in the IDE. Make sure your driver for the board is installed correctly. If you cannot get this to work at all, please shoot us an email at techsupport@sparkfun.com. You may simply have a bad board. I got it to work. Thank you! Hi! I recommend looking into the XBee Explorer Regulated http://www.sparkfun.com/products/9132 board. It translates the 5V serial signals to 3.3V. Email us at Tech Support if you have anymore questions. Can the mega be used as a HID device as it is? And if not what kind of hardware would be required to set up a HID interface? This was my second Arduino board. I first found out after buying that I didn't need the MEGA at all, well for most of the basic stuff. But hey, it's 4x faster on uploads than the UNO. For me = JOY. And it looks like I have more homework to do to get something big happen with the MEGA. Just to say that at first I tought that I paid more for something not very usefull for a beginner. Well, not really ! Can it be powered directly from usb port? Says on Arduino's website, yes. "The Arduino Mega can be powered via the USB connection or with an external power supply. The power source is selected automatically." is all over the internet but no solution so far. Somebody knows something about it? This is generally an issue with the bootloader on the board, or having the wrong board type selected when uploading code. You can try reloading the bootloader as a fix. Wow a very late reply here. LOL. Anyway a quick search on Google shows various issues here. If you have Windows 7 64 bit for instance and this is the first time you are trying to program the Mega then chances are you are running into driver issues. The best way I found to fix this is fairly simple. Let me pick from a list of device drivers on my computer. Uncheck the Show Compatible hardware. Find your Arduino program folder and go into its Driver folder. Click ok etc until out and walla you should now see it. If it is not Windows 7 64 bit you can still try this method. The most important thing is it shows up under the device manager with a valid COM port. If it does not show up under Device Manager properly or shows up but failed then that is the first thing that must be solved. I realize this is way late for this member but it might help others who stumble in here. 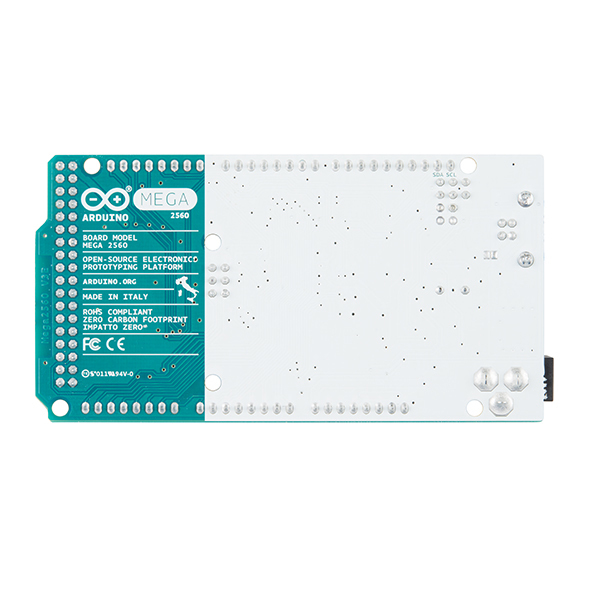 The Mega 2560 R3 seems an awesome Arduino - I have one on backorder. I know that the schematic is available as a .pdf: a consequence of using Eagle it would appear. My problem is that I can read the schematic by using the appropriate Adobe reader size factor, say, 300%. But then printing with reader's current view gets scaled according to the "paper size" as shown in the lower left corner when printing to 8 1/2 x 11 paper. I intend using the Mega 2560 in a course and would like, ideally, to have the complete schematic in both readable AND printable form. This would necessitate splitting it on to 3/4 8 1/2 x 11 sheets but this is not a problem. In the current .pdf form this is difficult. I have experimented 200 - 300% blowups and taking screen shots using MWSnap 3 (free) and printing the different shots. The use of scissors and sticky tape (tedious!) yields a complete readable hardcopy of the schematic that is not user-friendly. Does anyone have a better idea? Or even undertake to produce the schematic on several 8 1/2 x 11 paper - the individual sheets do not have to "line-up" for my needs. Have a poster printed at your local FedEx Kinkos or similar storeâthey can do it directly from the PDF, which you can bring on a USB stick. Thanks labreuer. Fedex doesn't have any Kinkos in Quebec but Staples has numerous Copy Centers. They printed the schematic on 11"x17" which is quite readable and much less expensive (although smaller) than a banner at ~$1.50 a copy. I may still get a banner printed to put up on the wall for class purposes. Well, no, your problem is not solved. 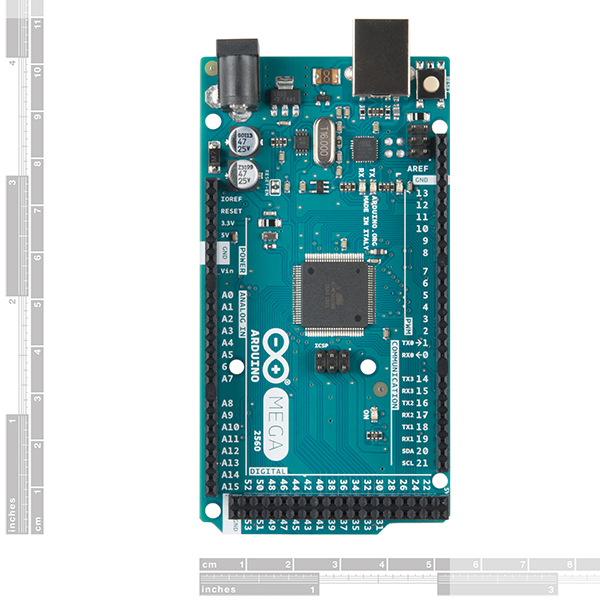 The schematic on the Arduino Web site is not consistent with the R3 board. The most obvious discrepancy is that two of the connectors are 2 pins longer than the schematic claims them to be; I expect there are less obvious discrepancies too. If we're lucky, the Arduino gang (or someone else) will post a correct schematic before the action moves to R4, leaving R3 an undocumented orphan. I'd have expected SparkFun to warn customers about this product. I knew that there were discrepancies between The Arduino schematic and the R3 product as shipped (just got mine). At least I work on the hard copy to make the corrections in a m ore or less permanent manner. Now running my MIDI bass pedals! Very excited to have received the microcontroller , learning something new everyday. I'll tell you up front that my 1st mega is no longer recognized by my computer. I'm not sure why. Probably a static discharge. But, I was impressed when it did work. I had to buy a replacement. It is a delight to have so many I/0 pins that give me the freedom to do just about anything I want to do. Whether I'm running several tests at once for a single project, a vehicle, or a machine, I have yet to run out of I/0 pins. It is great for a project that uses several analog inputs. Once you run out of pins on the uno, the mega is a good step up. Works just as I need it to. Upgraded from the Uno so I could make a 20 button "jeopardy-like" game buzzer system. I needed at least 20 digital pins and it worked like a charm. Still a newbie but has worked for me so far. Doing exactly what we bought it for, controlling the street & building lights on our HO club layout. We'll buy more. This board is very well made and functions perfectly. On my board the reset button is located in the corner next to the USB port which was a little disconcerting, but it does work well. If you are new to micro-controllers get yourself a sensor kit, a meter, the Arduino For Dummies book, and have a ball. If there were some more analog inputs I would be elated beyond measure. Definitely impressed with the amount of configurable I/O points and the processor itself. The Mega is a powerful device with endless possibilities. I was a little apprehensive about the project since I have had no experience programming in the Arduino language but I have programmed in Python so I went with it. The transition between Python and Arduino was painless as I assume that anybody with any structured text experience will feel the same way. Simple, fun and limitless. This is my main development board but, actually, the Uno does most of what I need. But, I'm currently working on a project that will also include a LCD display and a keypad so the additional IO of the Mega will be great. Started usung it minutes out of the box. using to prototype a game. zero problems. I got this as part of a coursera mooc I am doing. If you haven't tried one, I suggest taking a MOOC of two. They are a maker's best friend. Nice Unit! Very powerful and low cost! This device has sufficient memory to save a large script, tons of I/O and serial capability and is very inexpensive... I use it for various prototypes and I may even use it in some of our final tools. I am just starting to use small LCD touch screens with it and it is great! Well worth the money! Good documentation, just make sure it is current revision if you search the web. Sparkfun delivered on time, even through the holidays. I own four Arduino Unos but needed the extra power that a Mega delivers. I have not been disappointed. I've been using my Mega with an Ethernet shield and the extra space and memory has really come in handy. Great product and I will purchase from Sparkfun again for future project needs. The additional memory is a big help for projects using a wifi card. If you are looking to put your Arduino on the net I would not waste your time with the Unos and other 32 MB processors. The board is nice, but the images on the product page DO NOT match the board that I received. The reset button is in the corner near the USB port, and the board lacks separation between some of the headers. Not a very big issue, but I bought a case for it before hand that did not fit because of this. I would hope that the images can be updated to what is actually being shipped. Works great! Needed it for the extra digital inputs. Great board for bigger projects. Now I see what all the excitement is about! I bought an Arduino Mega to prototype some ideas for drones (it worked great!) and was so impressed with it, and with the pyFirmata software, that I ordered four more for students to use in class. Stuff that took me days to attempt (usually unsuccessfully) using an ordinary computer with adapters and the like, takes five minutes with Arduino. My only regret is that I didn't try it sooner. Sparkfun is an incredible resource for researchers, students, and hobbyists. I've never had a reason to complain about this or any other order I've made with you. Live long and prosper! My first Arduino experience is this Mega2560. I found it very easy to set up and use. I have several fun projects that I have started with these boards. Great service and fast shipping!! I received the item along with tons of other things I ordered quickly even though it was shipped internationally (I did go with the FedEx Priority option, though). However, I regret the fact that I didn't get a full kit which contains all the components I need to start and I spent quite a bit of money and time buying the components separately not to mention that I had to buy some of the equipment on my own which kinda affected my schedule. However, the product was great and didn't face any trouble! Keep it up! I already had maybe half a dozen Arduino Uno which I recently learned could be programmed through Simulink (www.mathworks.com/products/simulink). However, you can only download the code into the Uno and let it run unattended. With the Arduino Mega 2560, you can run the code in "external mode" where the model running in the Mega can be monitored and controlled from the Simulink visual interface. This is the kind of thing I used some years ago (with other hardware) to build a hardware-in-the-loop simulator of a Cessna Skymaster. This has serious potential. This is an excellent product. All of the components are well soldered, with no solder run or flux stains. All parts are squarely mounted, and the overall feel is of a quality product. The fine printing was clearly legible, although the ink is very sensitive to rubbing alchohol. If you need to clean your Arduino, do not use rubbing alchohol.The board booted upon connection to my computer, and was silent with little or no heat generated by any of the components. The only hitch was having to identify the board as a Mega in the Arduino IDE, but that's easily done. Both the board and the IDE performed a expected. With 54 more pins than the Uno, this board is an excellent choice for larger projects. It's handling a task of importance at work quite nicely. The possibilities are endless what you can do with these things. I am using this board to supplement my training in c programming. Getting to know it better and will enjoy my time with the learning. It doesn't have any malfunctions... It was smaller than I expected, which is good. Your service is the best!!! Sparkfun is an excellent operation. I hope can get up there to see the store and buy all things I want for my projects. Robert J. Jones Manager of electrical Labs for Red Rocks Community College. Although it could have been a 5 star review. I will only give the unit a 4 simply because the PCB came in a paper box with NO ESD bag around it. While this has nothing to do with sparkfun, the Arduino people should be ashamed of themselves for shipping a static sensitive piece of electronics without protection. have used this device about a month. most of the month has been studying technical docs., learning Arduino IDE and C/C++. Anything new will be difficult at some level, however, documentation has been accurate so far. Yes, I would buy another for the next project(s). More GPIO pins than I know what to do with! I have all kinds of sensors and inputs attached to this thing with room to add more if I want which I love. The board has worked perfectly right out of the box and I am really happy that I bought one. The Mega 2560 R3 is probably the best value for money. So many pins; I have not yet run out of inputs or outputs! Like its stable mates, the Mega 2560 is so reliable. Started with an UNO. But my project needed just a little more sensors and programing space. The Mega worked straight out of the box as both hoped and expected. Can't wait to build my next project. This board is now branded as Arduino.org as opposed to the previous boards which are branded as Arduino.cc. I have both versions, both purchased from Sparkfun using this part number. 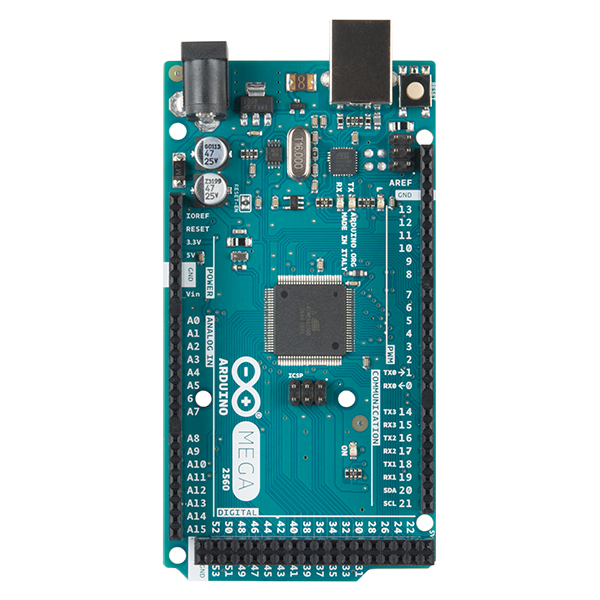 As a result, the Arduino IDE reports these boards as being from an uncertified manufacturer. Also, these boards come with a sticker on them that says "DOWNLOAD THE NEW IDE FROM ARDUINO.ORG". This IDE is forked from the original Arduino.cc IDE. Shady stuff. Good news is the board is authentic as it has made in Italy. It does work. In some ways it is a rather amazing little board. Bad news is I believe the boot loader is flawed. I loaded "blink" but now any new program is rejected. As far as I can tell your programmer will not work with this board so I bought a Pololu programmer which seems to talk to the 2560 but using the Atmel software. Of course the Atmel IDE uses different libraries than Arduino. Nothing is simple. Anyway I think the Arduino IDE which I would like to use will also work but I have not figured how how yet. I must admit I have not had much time to work the problem. I always have Atmel as a fall back option. I have had no problems with my Arduino Mega. It has worked well and definitely lived up to expectations. The inclusion of an acrylic mounting plate, sets Sparkfun apart from most other distributors (Adafruit, Et.). I will be purchasing all of my microprocessors here, as opposed to another supplier. For the price this is a great board with lots of IO and enough interfaces to handle a lot of jobs. It might not have the performance of a Pi, but it's very easy to use and connect to lots of sensors, servos, etc. Great value. Works perfectly! Hooking it up and plugging it in was very easy. I might be biased since I've studied a bit of electronics in school, but really, I figured that setting up the arduino software and configuring it to work would take maybe an hour or two, when in reality it took maybe 5 minutes or less. Even figuring out how to change the pins in an example software from digital to analog was easy. The number labels are great, it's pretty small, it's a cute color, it's great. The only problem I've had with this thing is finding a USB cable for it - I had to visit 2 convenience stores instead of just one (I'm a university student, so this in total took maybe 15 minutes). To note, I am only using it to do fun side projects, not anything "important" like monitoring whether my house is being broken into or any crazy IoT stuff. Lighting up LEDs is satisfying enough for me. This is original Arduino high quality product. It's pleasure to work with. Contrary to many counterfeit boards on this one all connectors match Arduino shields perfectly and all shields I use work with no issues. I highly recommend this product. Authentic Board worked whereas knockoff didn't. Four times as expensive as knockoff but it worked. Like the plastic retainer which makes it easier to attach board to other things. Nice to have pin numbers on the sides of the female headers too. What else is there to say? It works great.